I wrote in August 2013 how Forest City Enterprises' first Corporate Social Responsibility Report got Atlantic Yards wrong, ignored the Ridge Hill corruption scandal, and omitted requested data on campaign contributions, displacement, and government assistance. Well, now that flawed report is part of corporate public relations, notably being used increase the "Intangible Value Assessment" on one scale. ....The report garnered more than the attention and praise of many stakeholders -- it also directly supported an increase in Forest City's rating from a key investment research firm. 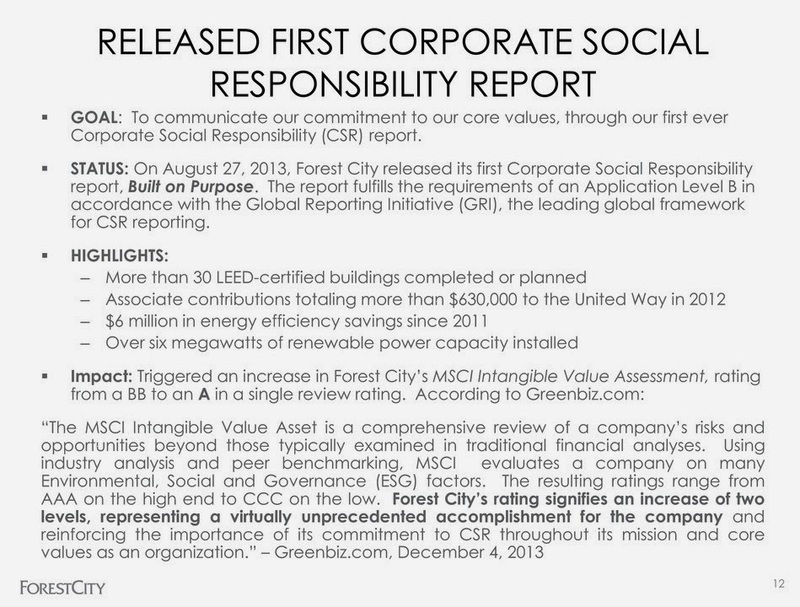 Information about Forest City's initiatives and commitment to responsible business practices improved the company's MSCI Intangible Value Assessment rating, rising from a BB to an A in a single review period. Of course Forest City's omissions went unmentioned. Nor were the deceptions in marketing EB-5 investments mentioned. In the video below, Chris Heinz of EnergyCAP, Inc. interviews Ziegler and colleague Joyce Mihalik. "I also just generally love our urban, mixed-used developments and the way we are able to preserve historic flavor and the historic urban fabric but also create modern... places for people to live and work and shop," one of the Forest City speakers says. Apparently omitted is the "historic urban fabric" of the Brooklyn buildings they demolished for Atlantic Yards.